How do you want to feel when you look at your schedule for the week? When you get dressed in the morning? When you walk through the door of your studio or your office? When you pick up the phone? When you cash the check, accept the award, finish your masterpiece, make the sale, or fall in love? How to you want to feel? Knowing how you actually want to feel is the most potent form of clarity that you can have. Generating those feelings is the most powerfully creative thing you can do with your life. 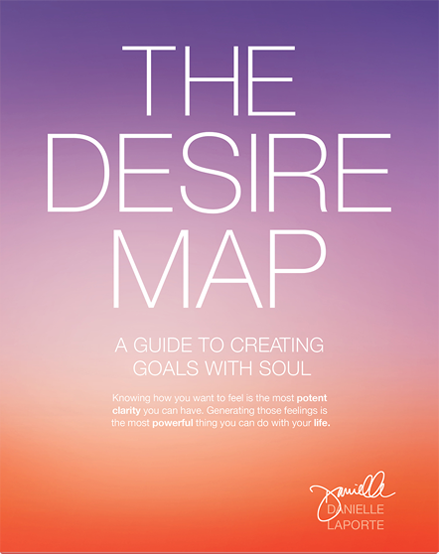 The core principle of The Desire Map is simple — turn goal-setting upside down. Usually we set goals based on “should”s and expectations, but what we want is a feeling. So find that feeling first. When we want to feel courageous more than we want to check accomplishments off our list… when we want to feel free more than we want to please other people… when we want to feel good more than we want to look good… then we’ve got our priorities in order. Danielle posits desire as the core of human experience. It’s what gives us momentum and energy. It’s what drives us to evolve. Desire hurts so good. it is an ache that we will never escape, nor would we want to if we want to be fully alive. Yet, joy is scary, in its own way. Thinking about joy reminds us of the scarcity of life. We leave gratitude and start feeling for loss. What if we lose that joy? We don’t want to be too happy — not feeling too happy protects us from our imminent fall… right? Thinking about happiness means we have to go out and do things. We have to act and take risks, and perhaps, fail. We have to disappoint at least a few people along the way. Committing to try something means, probably, that we lose the option of trying something else. And that energy is scary. Positive emotions can also be threatening to the people around us who’d prefer miserable company. Joy does not fit into the box of the status quo. I used to think that cheery, consistently happy people were too “lite,” too… in denial of something. Broody was more fascinating. Then I considered the fact that during the most excruciatingly different times in my life, forward motion came down to this declaration, this mantra: I will do whatever it takes to feel joy. I was there. I fawned over complexity, mystery, and aloofness. “Coolness,” in short. I loved the damsel in distress. I still see the beauty in bittersweetness, but I also respect the richness and complexity of joy. Happiness is not as thin, glittery, easy, overly sweet, as people seem tho think. It takes effort. It has so many shares and subtleties of its own. Committing to joy as a core desired feeling would mean that I was declaring myself worthy of having everything that I wanted. It would tie me to a universal longing and to all of the other humans who share that longing. There would be no excuses for neglecting my Soul. Some dusty to-dos would have to be imploded to make way for more dynamic soul imperatives. Some ambitions could die. Some things would have to give way to truer pursuits. A guru once told me that when we say. “I love you,” we really should be saying, ‘I am love.” Translation: OWN IT.